IDJ and Hugh Farmer. 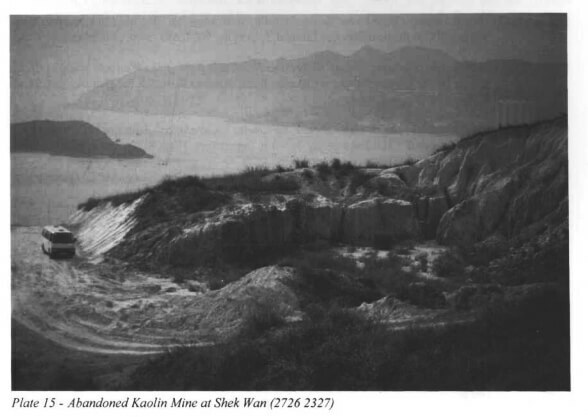 IDJ has sent this early 1950s image of a Kaolin Mine in the New Territories from Hong Kong in Picture and Story by John and Veronica Stericker published in HK in 1953. 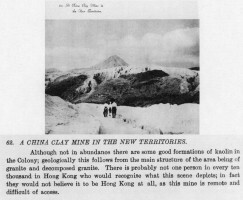 HF: The writer is correct in thinking ” not one person in every ten thousand would recognize what this scene depicts, in fact they would not believe it to be Hong Kong at all”. Indeed it looks more like three intrepid, if under-dressed, climbers setting off to attempt the unclimbed NE face of the imposing Alpine peak in the background. Let’s begin our search. 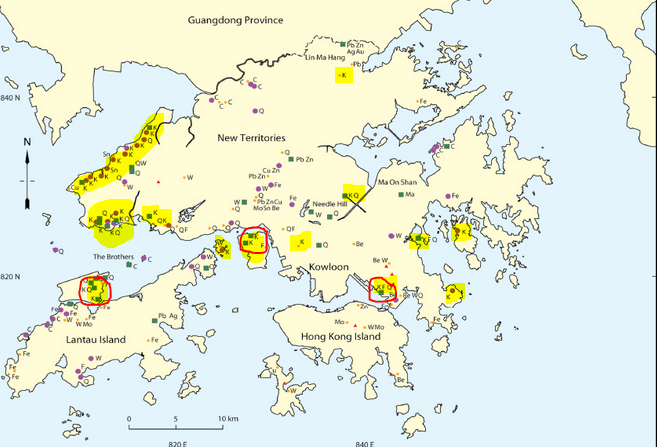 I have highlighted on this map all mentions of kaolin excluding those on NT islands. As you can see Kaolin clay occurs in many locations especially in the NW of the NT. 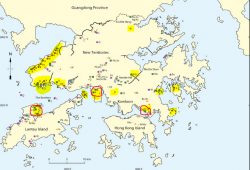 However it has ony been mined at Cha Kwo Ling, Tsing Yi and Chek Lap Kok. I have circled these in red. 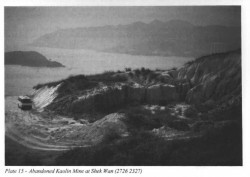 And a photo of the mine. Apologies for the rather murky quality. Another photo. Again apologies for the poor quality. I think IDJ’s image is not Cha Kwo Ling. 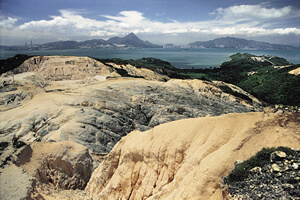 Is the pointed mountain in the background one of the three peaks of the highest mountain on Tsing Yi, Tsing Yi Peak/Sam Chi Heung (三支香)? 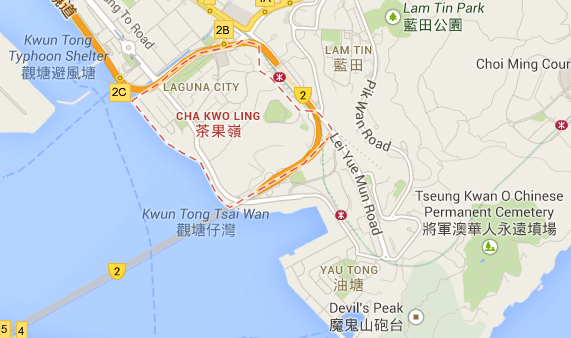 Or Castle Peak near Tuen Mun, across the sea from Chek Lap Kok somehow appearing larger than it should. 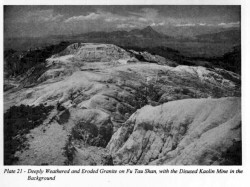 Castle Peak can be seen in the background of the Langford 1994 photo above. 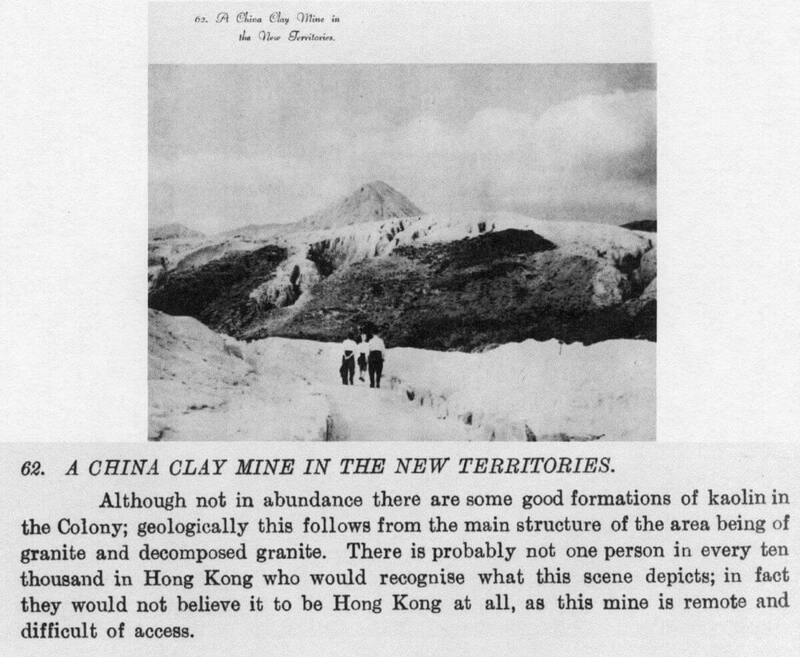 Or a demolished hill on Chek Lap Kok with which I am unfamiliar? I don’t think it is any of the Lantau mountains. This article was first posted on 10th May 2014.